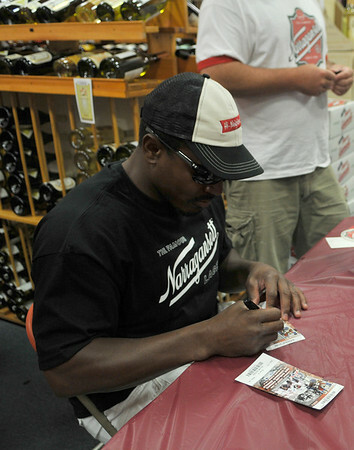 Gloucester: Troy Brown, the Former New England Patriots all-time leading receiver, who is now a part-owner of Narragansett Beer, signs two Patriots tickets to be raffled of at the Liquior Locker Saturday afternoon. Desi Smith Photo/Gloucester Daily Times. August 16,2009.